EA’s or Expert Advisors as they are popularly known especially in the meta trader community are programs that allow automation of analytic processes. What this means is that you can convert your trading strategy into a code/program, backtest it to see if it had earned money in the past, and take profitable strategies live as expert advisors. You can have multiple expert advisors running at the same time, and the EA will do the job of spotting and alerting you with any buy or sell signal that is generated. 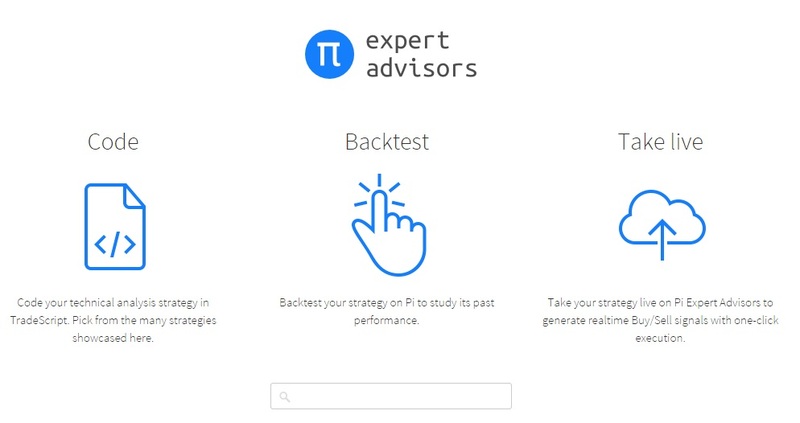 With Pi, we have introduced the concept of expert advisors for the first time on an Indian trading platform. The next time you trade or take someone else’s advise, make sure to first backtest them, it is one of the first steps to take towards trading success. The programming language used on Pi is called TradeScript, intended for traders who want to code their own trading strategies but don’t know how to program in low-level languages like C, C++, and others. TradeScript is good for traders who don’t know programming, and for those who are looking at it as a stepping stone to get started with backtesting or having programs (EA’s) spot trading opportunities. But for professional traders out there who are adept at coding and run complex trading strategies, TradeScript will not fit the bill. For the professional programmers we have Pi bridge through which you can fire in orders from almost any source. The backtest option is available under the alerts menu on Pi. You can select the contract/scrip to backtest as shown in the image below. Your buy code in TradeScript. The example above is for an exponential moving average strategy, so Close>EMA (close,50) which means buy when closing is above 50 candle exponential moving average. Similarly click on Sell and mention the code Close<EMA (close,50). Define the periodicity of the candle and how long you want to backtest it for using Bar history. In the example above it is a 50-minute EMA, so periodicity is Minute and Bar interval is 1. I am backtesting for the last 30,000 candles and hence mention the same in Bar history. Click on Back Test. All the processing is happening at your machine, so the more powerful your machine is, the faster you will see the backtest results. All the results with individual trades will be mentioned in this box. In the example above, there have been 1920 trades with 1554 losing and 366 winning in the last 30,000 minutes. Even though there are more losing trades, the strategy is still net profitable (without considering costs) as it has made 8782.5 points in the last 1900 trades. If you are backtesting smaller number of candles, you can also initiate the chart. Usually the indicators on a backtest chart are plotted separately, this can be dragged and dropped to the main candle panel as show below. Backtest Chart. left click on the blue EMA line, drag the white square box to the main candle panel. Backtest chart, same strategy with 3000 candles. Now that you are satisfied with the backtest results, you can create your EA. 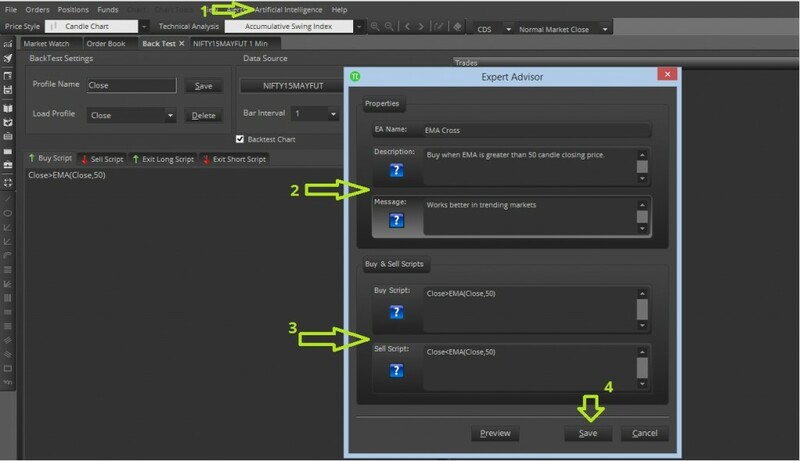 Click on “Create new Expert Advisor” under the main menu Artificial Intelligence. Give your EA a name, and if you want give it a description and/or message like I have done in the image above for the EA that I have named EMA Cross. Copy paste the same code from your backtest window for buy/sell respectively. Click on Save, this will create your EA – EMA Cross. Open the chart of whichever scrip you want to apply the EA to. I have opened a Nifty future 1-minute chart (the same contract that I had backtested). Clicking on Apply Expert Advisor under the Artificial Intelligence menu opens up the Expert Advisor box. From the entire list, tick on the EA that you want to take live. We have given a bunch of public EA’s to help you get started. If you want to take only the EMA Cross live, tick on the box next to it. You will be able to see the description that we had entered earlier. You can also see that you are the owner of this EA, and it is not a public EA. Click on Apply to take the EA live. You will now start getting buy/sell signals based on this EA. To disable EA’s, untick and apply. You should also see this EA icon as shown below once you apply. You can also have multiple EA’s run on single/multiple charts at the same time which is humanly not possible as shown below. I have taken 6 EA’s live on Nifty at the same time. Click on Generated Alerts under the Alerts menu to initiate the window as shown above. All the EA’s, whenever generating a buy/sell signal, they get logged on this window with their names clearly mentioned. If you wish to execute an order based on this signal, click on the Buy/Sell box. You can change the quantity/price on the buy/sell order form. You can enable/disable sound alerts for Expert Advisors as shown below. Generated alerts can only be executed manually by clicking on Buy/Sell on the Generated Alerts page. You can find the TradeScript user manual under the Help menu on Pi. We have also given over 30 public EA’s to help you get started on Pi. If you have any queries on coding a new EA, you can visit this section on Tradingqna. We also have built our Expert Advisor page, where we will soon have over 100 public EA’s with code. Another really cool feature with EA’s is the Consensus Report. You can use multiple EA’s and get a consensus report using all of them on how bullish or bearish a particular scrip currently is. Click on Run Consensus Report, select either single or multiple EA’s, and click on apply to see a consensus report like the one shown below. Wud be great if you list all the Amibroker snippet equivalents for TradeScript. For example, the previous candle is defined as Ref( L , -1) whereas here its slightly different i think. Renko on Pi needs some fixes, we are working on it. Suggest you to use the charts on Kite if following Renko. You guys created amazing product/company Zerodha. I wonder all strategies are Math calculations. I mean why would any retail investor learn technical analysis when softwares like Pi-bridge can automate strategies execution and make money. Do you have any software which can signal buy/sell based on All the indicators and Technical Graphs available. Why we retail investors need to cram/learn. Thanks Vishal. There are zillions of indicators, so unless you know which one to use, tough to give buy/sell. is there possible to got all the stocks list that crrosed 10-20 or 50-100 sma crossover at the end of the day or in live market from all nse scripts not specific scripts. Currently no, maybe in the future. It should be possible using Kite API. Right? ie. Scanning all the stocks and sending a alert when a event is triggered. ie. Scanning all the stocks and sending an alert when an event is triggered. 1. macd 2. stochastic 3. rsi. Suppose stochastic give buy signal and green arrow appear in chart with “2” written under the arrow. And again Thank you. Saroj, we are coming up with a solution for this. Will take us a couple of months. You need to first open a chart, only then will the Apply EA menu gets enabled. Hey Vivek, we will have the entire list of 100 ready soon 🙂 . 30 public EA’s are available on Pi itself. When you open a chart, and click apply expert advisor, you can see this list. I have just opened an account with Zerodha…Here I checked with Pi…I could not found 30 EA’s…Instead there are around 10-15 EA’s mentioned when we go for applying in the chart. Request you to upload all the EA’s available on zerodha website to the software Pi.. Check this link: https://zerodha.com/expert-advisors/ has over 50 EA’s. Pi will take quite a long time to be available on Mac as it uses microsoft components. Any updates on Pi for Mac? Hi Shubham, this isn’t something we’re working on right now. This would take some time. Maintaining and updating applications that are installed on a client’s computer is a challenging task, hence the shift to web-based Kite. Why not put a option to convert this page as a printable format ? That way I can take a printout instead of opening the page everytime I need to refer. Hmm.. we haven’t got any requests on this yet, let me bounce this off our team. Nithin – I am trying to understand backtesting and pi. Are there any videos and can you provide me phone support please? Lakshmi no videos on it for now. We will have something out. For now you can look at codes on : http://tradingqna.com/algos-strategies-and-code and https://zerodha.com/expert-advisors/. New version is crashing too much. If i open more than one chart it crashes,from morning till now it happened 6 times. multiple charts is crashing, we will have this fixed by eod. Until then I suggest you to open charts with lesser than 500 candles. software itself. And your software is updated to latest. your [email protected], Which delays the matter ? 2) Also another doubt is the code language used in Zerodha platform and Pi platform is same ? Since your Pi is your latest, can I see the link or all codes done in Pi platform. Then only I can decide to go for BRIDGE connect to AMIBROKER. 3) the alerts generated in Pi platform cannot be transfered to SMS or email, to avoid near the computer whole day.? 1. The latest release of Pi has the option “Check for updates” in the help menu. 2. You can see quite a few sample tradescript codes here. But this is different from AFL used on amibroker, so a little confused on what you are asking. 3. Not possible for now. When I click to open chart, it stops working. it is happening again and again. Krunesh, open charts with lesser than 500 candles (as less as possible), it will work. We will have this sorted by eod. I want to do this backtest using spot prices, but data source is available for future prices. Is there any way to backtest our code with spot prices? Yes dvr, while backtesting instead of choosing Futures, choose spot. Currently there is historical data for the top 200 stocks, and Nifty/Banknifty spot indices. Thanks nitin, I think i can’t see the spot option as my account is only enabled by FnO trading only. ah right, so you have to either open a new demat, or send us a client master proof from any other demat that you hold. This can be mapped, after which you will start seeing spot prices as well. Yes, we will add it soon. R.K, if you are opening futures historical data, you will be able to see it only from when the contract came into existence. So May futures, you can see only from Feb end. If you open spot/index charts, you can see intraday from last 7 to 8 months, historical upto 5 years for top 200 stocks, Nifty and Banknifty. (1)Can I automate the trade execution part as well? Meaning if certain conditions are met automatically execute buy/sell of a script(without any manual intervention). (2)If above setting is possible, please confirm that once done above setting can be switched ‘on’ until I manually deactivate same. I need to take the human emotions completely out of trading. The facility is there on the platform to automate trade execution, but we can’t offer as the exchanges in India don’t allow retail automation of trading strategies. So an individual trader in India cannot do automated trading, even if he puts more than Rs 2 lacs in his trading account? Any other options which he could explore? Prateek, yes. Exchanges say that if the strategy is running on the brokerage’s server, and if it is approved, it should be okay. But again, regulations around this are very grey. Nithin, how about if we can trigger trades using some scripts using Zerodha client login..? I have created a strategy and applued it in EA. Now I want to execute the buy / sell orders automatically as per the signals. Could you please guide me how i can do it through Pi. in the image above(http://zerodha.com/z-connect/wp-content/uploads/2015/05/back2.jpg) a backtest is being done using the 50 ema crossover. somehow i feel it cannot be so profitable as is being suggested by the backtest report(i know its not inclusive of costs. but even if costs are factored in, its still a very good outcome 8782 pts profit may reduce to maybe around 3000 pts). my question is: can i fully rely on the backtest report, when even such a simple strategy appears to be easily profitable? Vivek, you can plot the backtest with the chart to see the buy/sell signals on the chart. You can also look at the trades that show up in the backtest report. I think back test report is not reliable if it computes profit using ltp. In backtest which price considered ,Is it LTP or Buy/Sell ? If Buy trade then it always gives seller price as displayed on live . I have apply EA of 14-26 EMA crossover but I am not able to see any alert in generated alert box why is so? and whenever I do anything in artificial intelligence section PI got stuck. Getting someone to call you back. 1. Why you don’t have Channel breakout indicator in Pi, it does not have to do any calculation at all. 3. The Pi upgrade link is not working, every time I enter my user id and password its rejecting, also it blocks after 3 attempts. More indicators will come soon. About upgrade link not working, best to send an email to [email protected] with your client id, someone will get back to you. Can you let us know the formula, we can have it added. If you are talking about this, we will have it coded soon. i got sms regarding new version of Pi dated 11.5.15 but not able to find the link. Please help. It is available when you login to Q under the Pi menu. You can send an email to [email protected] if you still can’t with your contact number. I want to know the code for ADX and MACD to back test please can anyone help me. I am sending u these stregies. can these be coded by ur team. 1. When 12 ema crosses above/ below 26 ema with increae in volume. 3. When scrip is +5% or -5% with increase in volume. Does ur software indicates intraday new highs and lows made by the srips. Sohail, brokerage is the same for everyone. Rs 20 per executed order. My charts are not loading in PI it says unable to “connect to the data server should be soon” . I am not able trade because of this. whom should i contact for this??? Charan, we had sent an email/SMS asking to update Pi with the latest patch available on Q. Go to q.zerodha.com, download the latest patch that you see under Pi menu. Run this patch, it should start working. I opened my account at zerodha on nov last year. Since then I have been quite satisfied with the service. But off late I am having some tough experiences from the support team. I really feel I should bring it to your notice, so posting it here. If you could get back to me, I can clarify. Kiran, can you send an email to [email protected] with the issue you are noticing? I am facing lot of problems while trading through current zerodha web portal, i am eagerly waiting for using KITE. So can you please let me know when we are planning to launch KITE. Request you to launch KITE at your earliest as your provided platform like Z5 and Android Mobile App is really really slow. Even many times I missed good trading opportunities due to this slowest trading app. 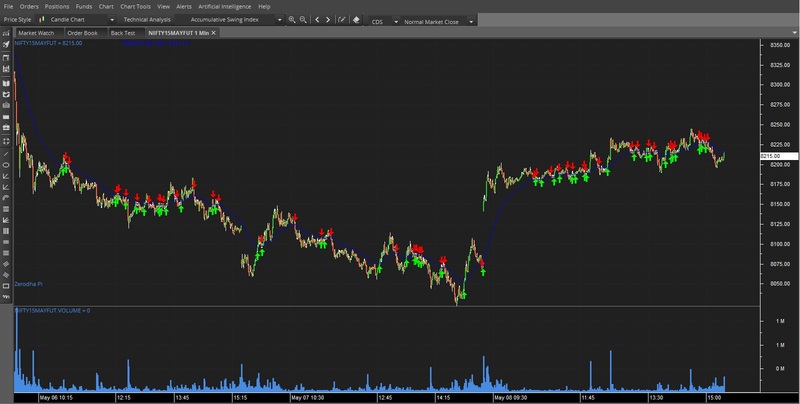 Can you generate best trade signals out of using many of these proven strategies and send to the terminal of clients as buy or sell orders with defined risk ratios. You can provide a option to pre select risk (quantity) of different levels and upon selecting the same, quantity should auto appear in the order. It should generate by default bracket order. It should be for top 200 cash liquid stocks, liquid futures,highly traded options, Nifty and nifty options also. We believe any recommendation with certain degree of faith, and we have full faith in you systems. This will provide lot of comfort for the clients. You should build expert team to get best trades using all these. For clients who are not pro in technical this will be like heaven. And also no need for clients to invest in costly hardware. Also if it can be done through call and trade then its awesome. Yes Krishna, but if we give such signals we will be getting into that investment advisory side of business. We don’t want to get there atleast for now. Have replied to ur email. Yep, we haven’t done advisory for last 5 years, and don’t intend to get into doing that in the future as well. Yes i agree , just concentrate on the scaling to large number of retail clients , no need for stock research etc , only need to get better in improving the technology part like adding more features to mobile app etc . Do you have any Mutual Fund Assistance with Zerodha? We’re in the process of setting up our MF desk. Should be up soon. We’ll keep you posted. pi will fire the orders, then what is the use of amibroker? The programming language on Pi called tradescript is not as advanced as AFL (amibroker formula language). So if it is any complex strategy, you will need to use AFL. 1) can we code in trade script about know the status of the order placed, and on order completion only place another order(placing orders with condition).? 2) is their any database connection or file support in pi, to record order number, order status, and values if any for that order.? 3) how amibroker know the order is completed or in pending.? 4) is the trail version of amibroker software sufficient to do intraday.? 5) is pi itself sufficient to fully automate the trading terminal of dealer.? 6) is their enquiry about order status available in pi(TS) or need support of ami(AFL).? 7) for pi based semi automation do i need to subscribe datafeeds.? 8) pi is not installing on my system. my OS date expired, is it the reason? 9) do you offering any API for pi based automation? 10) is Trade Script will allow to code for BO, AMO, and Basket Orders? Please Answer my Queries here. Dont reply with contatc tsiva or any other? 1. No, you can’t fetch order status using Tradescript. 2. Currently no, but we will soon have it for people using Pi bridge. 3. As of now not possible, people who fire orders using Ami and Pi bridge are doing it as market orders. 5. Yes, but we are still not letting this happen. 6. Using AFL you should be able to fetch order details using Pi bridge soon. 7. Semi automation on Pi using tradescript – you don’t need datafeeds as it is already available on Pi. If you are semi-atuomating through AFL, you will need data feeds to run Amibroker. 9. The bridge itself can be used for automation. I humbly request you that first you give a proper training your team (Those who are giving a demo on Pi). I am new customer of zerodha and I installed Pi. I thought clear some of my questions by arranging a demo. Unfortunately the person who gave a demo does not have a sufficient knowledge on Pi. I was really disappointed. Please setup a separate team only for demo. or else you create a video and publish in youtube. I know most my question were answered in z-connect blog page comments section. But I should go all the comments to find an answer. It is very time consuming. so please consolidate all the questions which is posted here and create a youtube video with answers. Yes Jay, we are putting up videos and we will train the team on this as well. Yes Nitin please, Because even i faced the same problem but slowly learning from Z-connect, most of the time even support team cant help on those…….. I know the effort you are putting and making it investor friendly so the the profit can be earned for both but when these new things comes in market for first time, you just cant leave the investors and traders just like that, this is a great opportunity for you as today in india more new and new young investors and traders are coming make the use of it. Hope you will work on it and hope you are really doing good. How to download Pi? Where to click for download? Everything explained on this post. I am long term investor, though i would like try this automation thing. Why this restriction of active trader to get PI? Vivek, huge amount of resources required to run Pi.So every instance of person using Pi, we will be spending more on the resources. Even if you are not trading, and have atleast 10k in your account, it is considered active. So i see this as if i am going to make profit i will become active automatically, else will not use and will free up resources. I do not want my money to sit ideal like minimum balance of bank a/c :), though i have reasonable holding of equity in demat. Should not holding be criteria too for PI? I am using MT4 based strategy can i link MT4 to PI or NEST Trader (ZT)? If yes please let me know more information. Bharath, for now it is not possible. MT4 is designed in such a way that it is very tough to send signals from it outside its universe. 1. is DEMA(double EMA), TEMA(triple EMA) provided in the backend? If no, is it possible for me to edit the library and compile it with my own extended set of formulas? 1. You can add upto 10 indicators, so you can add multiple EMA’s individually. You can’t currently create your own indicators. 2. When you apply expert advisors whenever an alert is generated it shows up on generated alerts window, you will also hear a beep. as i tried to trade with help of EA in Pi. But it is very difficult to trade as a lot of buy/sell signals are generated after a minute. so it is hard to trade. if one strategy gives buy signal, next minute it gives sell signal. it is very confusing. Harshal, the signals are based on the conditions you have set. If you are getting too many buys/sell increase the time period, that should help. 1) Is the coding language same for Z-platform and Pi platform ? 2) Is coding in Pi platform is limited for average and not for professional.? 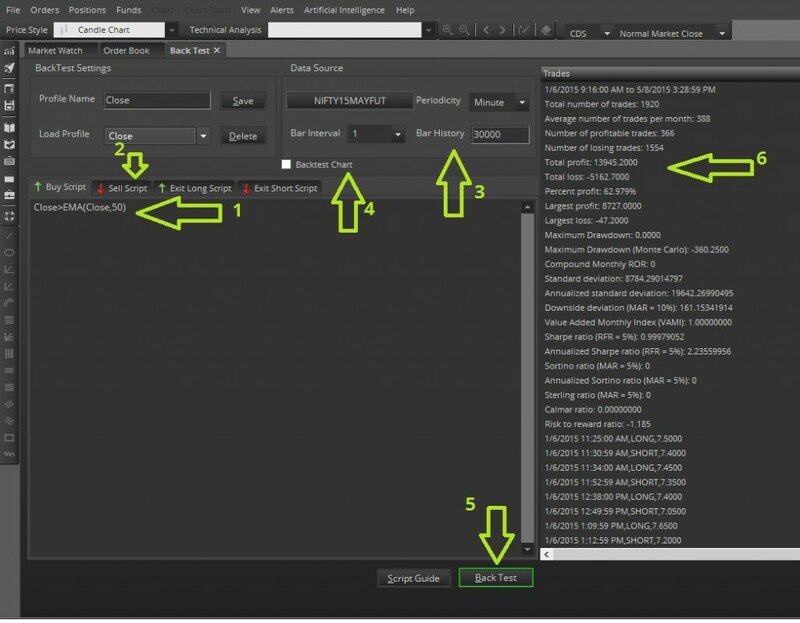 3) Can you send me the video link or examples of strategies coding already done for AFL amibroker platform. 4) What are the aproximate charges for coding, bridge connect and data per month. Thanking you for early reply. 1. It is only on Pi. 2. Tradescript the programming language on Pi is for traders who are not necessarily proficient at coding. SO yeah if you compare it to AFL, what it can do is limited. 4. We don’t charge anything for coding, and you have to buy data for amibroker from a data vendor (Data on Pi can’t be used for amibroker). Pi bridge for now is free, but it will cost around Rs 300 per month soon. Am trying to backtest the code while combining Stochastic (40,1,1,SIMPLE) and RSI (CLOSE,14) indicators. Pi very well displays the indicator (as shown the attached image) on the chart, but the backtest results throws an error message stating ‘%k slowing periods’ argument of SOPD is invalid. When the Stochastic(40,1,1,SIMPLE) indicator works on a chart, why doesn’t the same parameters work with the TradeScript? Thank you for your response. I understand that 9,3,9,SIMPLE are the recommended parameters for Stochastic. However, I should be able to provide the custom setting for my strategy to work. The custom settings 40,1,1,SIMPLE have been working very well for me (which I use in my charts). I wanted to code the same for the system to generate the alerts. Please let me know if it is possible to use these settings in the code? and i should be able to run this script on all FNO-stock to find the list of stocks which are meeting the criteria. I would remain thankful to you for the same. Chandan can you ask coding queries on tradingqna.com, we are answering all of them there. I am new to zerodha.I want to know that Can we create special codes for a particular stock. i.g. I have a strategy for any share that if that stocks goes up I should sell. 1. How to reference the long price in back testing exit long script. If I want to test strategy where I exit long if some condition is satisfied or there is loss of 40 points from buy price, how do i code it in exit long script.i.e how to put stoploss in the backtesting script. 2. While backtesting index futures, I can only select current futures and expired charts are not available. Backtesting against near month futures makes sense since volumes will be more in near month i,e if i want to test june future, it should use may future to test last month since volumes will be there and april future 2 months before instead of testing june future in may and april since trading activity happens there. To conclude availability of index data against near month futures across the months would be very helpful. 1. In the backtest, you have buy, buy exit, sell, sell exit options. If you want to backtest with different conditions for profit booking of buy and sell entry, then you will need to run backtest twice, once for buy strategy and use Sell and sell exit for Profit and SL. Similarly backtest on your sell strategy separately. 2. Yes best backtest on the underlying rather than the futures since there is no continuous futures data on Pi yet. If your strategy includes volume data, then yeah doing this on index spot will not be possible. We are working on giving continuous future charts in Pi, but this will take some time. I want to know how to code exit on loss of say x points in the script. Search is not working in the code referrnce document. As currently there are 30 EAs on website and as you said that Zwerodha is planning to launch about 100 EA’s in next few days. One suggestion here, Is it possible to suggest most popular or most used EA if user selects the particular stock for EA? Like if I select stock “tata steel” and for the same stock 100 people are using “Bearish Meeting Line (Short trades)” , 80 people are using “Three White Soldiers and Black Crows” and 50 people are using “Commodity Channel Index (CCI)” from past 7 days. So while creating new EA on users side is it possible to list those EA as per their popularity / use for that particular stock (in above case “tata steel” )? hmmm.. we can’t track which user is using what EA. EA’s run locally on the client machine. you can add facility to share individual EA’s to public if user is interested to help others! Also it will be helpful for all zerodha Pi users to know how other people are making profits, its win win situation for trader – Zerodha – other traders! Yes, we will start accepting individuals to start sharing their EA’s. Fazlur, we have received over a 100 new indicator requests. We will work on that, but first we are working on ensuring that everything else around the platform is optimized. I have an AFL indicator (purchased from some vendors) that shows arrows for buy and sell in amibroker chart, but i am not sure whether it will be able to connect with PI. can i connect the amiborker indicator arrow to place a order in PI, issue is that i don’t have the code of AFL. Yes Prabhu, you can get the AFL to fire orders directly into Pi using Pi bridge. Check this. 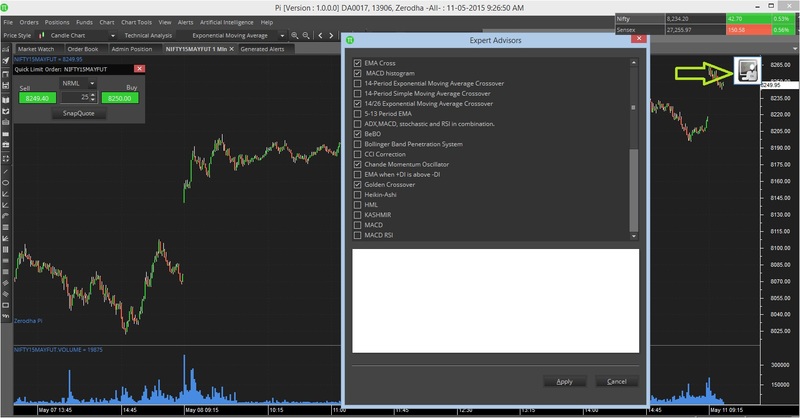 If you are subscribing data from neotrade analytics for amibroker, they will help you out in coding the AFL also. They have built a utility, if you drag and drop on a chart on Ami, it fires orders into Pi. Speak to them. 1) Is there any way in EA code I can add buy/sale exit also like in back test module. 1. Debajit, you can run two separate Expert advisors. So one to Buy and Buy exit (in sell, enter your buy exit code), and similarly a separate EA to Sell and Sell exit. Currently u can create multiple workspace, and load whenever u want a different marketwatch. But yes, multiple marketwatch is on our list of things to do. I am not expert in technicals viewing of charts , but i want your algorithmic based trading to help me in getting buy and sell signal time to time . This it seem your EA does. Is this correct what i have understood from your website. Yep, you are correct Ashok. a) I liked your buy and sell in the same pop up it is easy to quickly to trade on zerodha . a) does your software support historical indicators of over 1 to 2 years . What i mean is resistance points or lines drawn by us / saved by us in the system which act as horizontal line indicator and are very useful to us to show that the stock is at a particular resistance zone that may move up or down.When i try doing this it does not save for the next day . b) is it possible to add the nse nifty as an overlay over a existing stock . This could be helpful instead of toggling around. Chandru, both not possible currently. But on our to do list. The question raised by Sravan on (31/5) has not been answered. I also badly need to know how do it. I searched ref. doc and I couldn’t find way to do it. To refresh memory, the problem is “how to access entry price in exit long/short section?”. This will help us in doing things like putting a stop loss. Ram, with tradescript, there is no code to get the buying/selling price or other things like quantity. It is a limitation of the language. Not sure if this a right place for this feature. It happens that that I’m +10000 in morning and -10000 by afternoon. Is it possible to square off all positions when the net profit moves down to +3000 from +10000. Not possible Vishal, atleast for now. Thanks for the reply. Is it possible to plan for this feature in future? I think this is very essential feature for back testing. In this forum I need not stress enough the importance of stoploss. I have seen other software doing this. for example Ameritrade trading software. There is a simple check box for stop loss. if u enable it u can put stop either as % or absolute terms. For fully automated trading in Equity we need dealers terminal. is it same rules for commodity trading? some peoples said we can trade fully automatically in commodity. With MCX it is a grey area as of now. No written regulations as such, but they clearly say that retail should not be allowed. I have recently enrolled with Zerodha. Trying to learn PI and the scripts. For the default EAs, I could find scripts for Buy & Sell. How do I determine scripts for Exit Long & Exit Short? Krishna, if your buy exit and sell are two different strategies, you will have to run two separate EA’s, one a Buy EA and another sell EA. Not sure if I understood your reply though. I tried searching for learning material on your website but wasn’t successful. Can you pass on weblink of any material that I can go through to understand this better? Somehow attachment is not going through! Please let me know your email id, I can send it to yous separately. Someone form our team will get back to you. I indeed got a call already and the person who called me understood the issue. I had few more issues of which I have sent the screenshots. Excellent customer service I should say. Can Zerodha request for historical TICK data for NSE from day 1 of online trading (historical intraday bhavcopy) and integrate it within their system, including Pi? It will be great! Much better than all your customers chasing the much needed historical data out on the internet. Super and practical. Eagerly waiting for the same. From Day 1 I entered Zerodha, I am not able to trade using any of your Desktop, Web, Z5 platforms. Only i am fighting with your Mobile Trader application an d it works fine now.But, i would love to use your Web, Z5, Pi platforms to trade.Please help me. No good answer from your support team. Getting our team to call you back. i’h started trading in pi, so far so good. need some help with EA’s to start with and then algo trading, i do have a strategy, need some help putting and back testing it in EA’s. Thanks. We have some plans, but will take a while. i want overllay this pivot on price chart , like we can overlay avg in amibroker ? Ah.. Not possible Sudarshan. Amibroker is quite advanced that way. PLEASE INCLUDE A fEATURE SO THAT WE CAN WRITE OUR STRATEY AND SAVE IT AS A CHART TEMPLATE LIKE WE DO IN AMIBROKER . I am using PI. it is good. Kindly add available Margin to be displayed on top always so that it will be easier. please provide a feature of Pivot points as given in the below link. Next update will have this, u should have it by next weekend. In the scanner settings the periodicity cannot be set to ‘day’. So it is not possible to compare a current value to the previous day close. Can this ‘day’ periodicity setting allowed by pi. Atul do shoot all coding queries on tradingqna. Will forward to the tech team. I think that there has been no action from your technical team on my previous query in which I had pointed out that the scanner settings cannot be set to a day. I also find that in scanner settings, if “periodicity” is kept in “minutes” and the “bar interval” kept more than “10” the scanner gives a message about the “maximum number of bars possible” and does not allow the scanner to be set. I believe that if I want a few number of candles then the scanner should allow me to use the settings mentioned above. I want to set the periodicity as ‘minutes’ and bar interval as ’30’ in the scanner and pi is not allowing this to be set. Yep, we are working on the scanner issues, should be fixed by the next release in couple of weeks. Is it possible to have options in EA like in Back testing….. Buy….Exit Buy….Sell….Exit Sell? As currently we cannot use it for OPTIONS if we want to just Buy Options and then Sell. When I code my strategy and backtest it on PI, it sometimes says that the script generates error, but when I take a closer look, there is no error at all. Also the tool does not say in which line the tool sees an error if any. This is very frustrating when debugging. Please let me know if there are better ways to tackle such situations. CAN YOU CODE MY STRATEGY?CAN I TRADE WITH YOUR CHART FACILTY?WHAT ABOUT DATA? Ask all your coding queries here: http://tradingqna.com/. Yes you can trade from charts, check this: http://zerodha.com/z-connect/tradezerodha/pi-tradezerodha/trading-from-the-charts-pi . Data is live and free on Pi. My strategy to trade in stocks in cash market is to buy on EMA (9,21) CROSSOVER and book a small profit or to exit on EMA (21,9) CROSSOVER. I have back tested it on pi on 15 min charts. I would like to Apply Expert Advisors everyday on all the NIFTY 50 stocks at the same time so as to utilise the opportunity as and when arises. 1) Is this possible on pi? 2) To Apply Expert Advisors, the chart of the security is to be opened. ……Can the chart be closed after applying EA ?….if the charts can be closed after applying EA, than EA can be applied to any number of securities…..Right? 3) How many charts can be opened at a time ? 1. You will have to open individual stock charts to apply the EA. Currently max of 10 charts can be opened. 2. Yes currently the charts need to be open for applying EA. But we are looking at ways to take this limitation out. Can the chart be closed after applying EA ?….if the charts can be closed after applying EA, then EA can be applied to any number of securities…..Right? Robin, currently the charts have to be open to apply EA. After applying EA on a particular chart. I have closed it cause i have applied it on EOD chart. Will I still get the signals in the alert if there are any on daily basis without having to open the chart and applying EA again?? No Sumeet, for you to get alerts the chart has to be open and EA running on it. Have you managed to upgrade this limitation of Ea being applied to only 10 charts? I was back testing on NIFTY FUTURES (current month) and saw that the data is from 4 May 2015….I realised that the data will be available from the time the contract have started. Hence I back tested on CNX NIFTY….by selecting NSE and then INDICES….but saw that even this data is available from 2 Feb 2015. (Both EOD & intraday). Is there any other way I can back test data for NIFTY for a longer duration? Robin, we will soon add a lot more historical data on the indices for you to backtest. No date as of now, we are upgrading our database servers, along with it we should be able to give more data. The comment I just posted is awaiting moderation. It must be because of the links I have given in the comment (links to tradingqna). Please have a look at the comment. Yes Robin, will get someone to answer those tradingqna questions asap. Hello, i am going to open an account very soon.I just came across a site which offers Zerodha club membership in which we get different technical softwares and training like Amibroker and Metatrade etc. Any difference if i open account through that site? Must be one of our online marketing partners, shouldn’t matter where you open an account. It is all the same. after applying this on 30 min infy chart, backtest gave entry at te start of each 30 min candle bar, how to back test this strategy. I have snap shot but not able to attach. Vishal, can you click on check for latest updates on Pi under the help menu. Update the version of Pi and try again. Few cases where the last update hasn’t happened correctly some issues with backtesting. For whatever you don’t need a script, just mention 0. Also click on check for updates on Pi eod today. We have made some changes on EA’s. Can I backtest pivot breakouts? How to generate signals for pivot breakouts? Vinod, signals can’t be see on live charts, it will show on generated alerts only. You can have a sound alert set. EA. When applying two EA script on a chart. I am getting signals as EA triggered. But quite confusing which EA strategy is triggered. for Eg. 1. LRI and EMA Sometimes I get erroneous message when LRI triggered it says as EMA is triggered( in the source window of alerts).Any way I can adjust my mind , but I think You have to look into it. 2. I reported a problem (send email to siva also) when a strategy is triggered we have to wait for the candle to close for generating another alert( buy or cell). If the alert sounded as a buy and the same candle goes below the price there is no alert. and a buy alert remains there , but virtually it is a sell. cannot really trust on EA. Peter, you can name your EA by the strategy. So in the generated alerts window, it will show you which EA generated the alert. In technical analysis, trades are usually taken at the close of candle. But we are working on it to give the user an option to choose how he wants an alert, at the close or the way you want. Give it a few more days. I am in love with Zerodha. I have traded with 2 other brokers earlier, but Zerodha is miles ahead of them…. in technology and also in service….I love the positive and helping attitude of ur team. I have a doubt regarding the accuracy of back testing results. I back tested a very simple EMA crossover strategy on NIFTY Futures for 60 days and CNX NIFTY for 120 days period. I tried with different candle stick period (10, 15, 20 min). I was surprised to see a profit of (after charges) Rs.12,000 for one lot . That was for 60 days. For 120 days on CNX NIFTY, I got a profit of (after charges) Rs.23,000. Ofcourse, there were differences for different candle stick periods…. but on an average, this was the result. Even if we take a 10% error/deviation, the profits are too good to be true. Robin, last 4 months had two or three 500 point moves in one direction when EMA’s work very well. So possible, but do check if your code is right. Thanks for ur time and ur reply. 1) For backtesting intraday charts (5,10,15,20,30 mins), the maximum duration allowed is only 120 days (4 months)….. which is toooo less to get an idea of the profitability of any strategy. Please increase it to at least 1 year (365 days)….preferred will be for 2 years. 2) Also, please u[date data for CNX NIFTY for similar duration. For backtesting intraday charts (5,10,15,20,30 mins), the maximum duration allowed is only 120 days (4 months)….. which is toooo less to get an idea of the profitability of any strategy. Please increase it to at least 1 year (365 days)….preferred will be for 2 or 3 years. Pi is so power packed…… but without data it is weak. Pls, take it up on a priority basis. Sorry, I am bugging u too much. I have a request. This request can be fulfilled by making a very small modification on Pi. On Pi, when an order is executed, there is an announcement which can be heard very well even from the next room….which is excellent. BUT, when an Expert Adviser is triggered, there is only a SINGLE beep and a pop up. If I am in front of the monitor at that time and not engaged in any thing else, then it serves the purpose. But, if I am even little away from the monitor or in the next room or even in front of the computer watching some business channel, it is easy to miss the alert. Hope this suggestion is useful and can be implemented. I don’t know whether it is recommended. Locate C:\zerodha\pi\res. there is a wav file named “ExpertAdvisorSellAlert”. 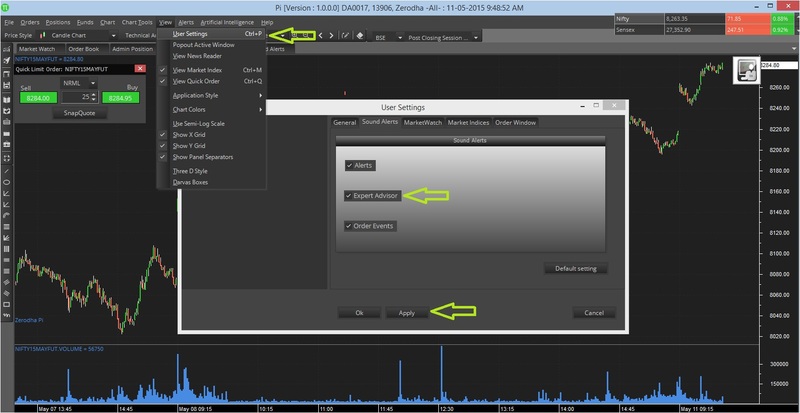 If you know how to edit wave file try it and make it multiple alert. Try to save the edited file in same name and preserve original file. It works. EA ‘strategy with previous and current candle’ – It prompts for a buy and generated alerts shows a sell.Please verify. http://www.omnesysindia.com/index.html….sir please visit this web int his they mentioned all their algorithm stratagies…my question is whether zerodha suopport this..
Ratheesh, a lot of those are meant for institutions. If you need anything in specific, let me know. sir, i looking for fully automated 2/3/4L Option Strategies,Butterfly,Straddle,Strangle. with little customization form my side..
Ratheesh, these strategies would typically require access to higher frequency trading systems. Presently retail doesn’t have access to these in India. A request , Can you add buttons on EA page-Select all/unselect all. I have been asked to upgrade my Internet to Broadband when I last reported issues with signal not generating as per condition when I take it live. Now I have upgraded to 2 Mbps Wired broadband which consistently gives me above 1.5 Mbps even after that the signals generated in live environment and in Back testing are different. I have sent a mail to you…….. Please, please, please go thru the mail. I am sure, other traders would have faced this problem in EA generated signals on Pi after the recent changes made. Have forwarded to our tech team. Checking it out. Is there an option to backtest with the ability to provide a profit target in percentage as exit trade? No deepak, both entry and exit has to be as technical analysis strategy itself. I am trying to back test strategy , it gives the backtest result but the chart is blank and the backtesting screen also hangs. When I try to close the chart window it says “chart is in use”. Please correct my code if it has some mistakes. I am testing on 1 minute nifty futures for 1 day data. The problem seems to be with REF(MACDHIST,2) as when I remove this term it works fine but I require it for my signal generation. I don’t know why some of the code is removed when I post the message. Current version of PI has set backtest limit to last 120 days only. Will this be increased in next version? 120 days is very restrictive limit for backtest , it should be minimum of 1-2 years. Arshad the limit of 120 days is on intraday candles only, that is like 50,000 candles of 1 min data. The daily candles can be backtested upto 5 years. But yes, we will increase the intraday data as well. Agreed for intraday 1, 2, 5 mins candles of 1or 2 yr there will be easily 50,000 candles or more which will put load on server. But the number of 1hr, 2hr , 4 hr intraday candles will be much lesser for 1yr or 2yrs. So I think you could still provide 1hour or 2 hours charts for 1 to 2 years. The reason I say is because there are a lot of positional strategies which use 1hr, 2 hr charts but carry over the trade overnight. Backtesting these for 1 year will give more confidence as opposed to just 120 days. Arshad, we are slowly increasing that data. When will the limit be increased ? it is still 120 days..
Why don’t expert advisors generate buy sell signals on the chart itself? Also, is there a way to apply expert advisor to all open charts at the least? On charts is on our list of things, will take some time though. You will have to apply individually. TREND(EMA(CLOSE, 50), 2) = UP returns no trades. I have the latest patch of Pi. This issue happens only for TREND with EMA. TREND with MACD or RSI works fine. Here, they use TREND(EMA(CLOSE, 20), 15) = UP which also does not work. Could you please recheck? Yes, you are right. It was my mistake – I was using too few days, so no trend was found. With 20 days 1 min chart, it works fine. Thanks for the clarification! EAs are really a great help to reduce manual monitoring as well as to reduce the emotional side when trading. Many thanks to the Zerodha team for providing this! So, how to arrive at this Risk to reward ratio of 0.234 from the above data? Or is any more data required for calculating this? You will need more data. You will need profit/loss on every single trade. Nithin, one feature request related to EAs in general. If I leave the EAs running on my computer, can the generated alerts be sent as notifications to Kite? This way we can execute the buy / sell at the right time with Kite on mobile even when we are not around the computer. Or do you already have some plans of being able to Apply EAs directly on the mobile through the android app that is coming up or in Kite itself? Ishwar, our longer term plans is to allow you to run strategies on the cloud. Alerts could then be fired to any device of your choice. But this is still a long way away. Any latest update on this? Do you have any near future plan to fire EA stratagy on Kite? FURTHER, I HAVE CALCULATED & PASTED PROFIT & LOSS OF EACH TRANSACTIONS ABOVE FOR YOUR REFERENCE. I am very confused in UNDERSTANDING RISK TO REWARD RATIO GIVEN IN PI BACK TEST REPORT, PL guide me how it is being calculated step by step in detail.. I discussed with few traders, nobody has answer.. And How Negative values arrives.. My understanding if I keep 1 risk to 3 profit, i.e, 1:3 = 1/3= 0.333 OR 3 Profit to 1 Risk, i.e, 3:1 = 3/1 = 3 vice-versa. Which is correct? how zerodha pi calculates? Why is nobody answering the query about how actually risk-reward is calculated on Zerodha Pi Backtest? There are absolutely no resources anywhere and many people are asking this question. Is it RISK/REWARD or REWARD/RISK and if so, what constitutes RISK and REWARD? Can a single EA script be used to run on all F&O scripts for parallel scans and generate alerts for multiple matches in Pi? You can use the scanner tool for that. The EA seems to be useful for only the intraday traders. I would like to use the scanner on all stocks (Closing price) so that I can identify buy and sell opportunities for short term trading. Is it already available? Am I missing something? EA’s could be used on daily charts. Yes you can also use scanners to run EA’s on group of stocks. Is it possible for me to apply an EA to a chart and get it stored in the system so that EA is active all the time and will show a signal moment i open pie ;if yes where can i see a list of all my active EAs or should i buy amibroker or other software . I am not very good at coding though. On Pi, you will have to run EA everytime you login to Pi. In Ami, you will have many more options, but you need to be proficient at AFL to make the best use of Ami. A screener or alert kind of system which can scan over all the NSE stocks during live trading and when ever my strategy is fulfilled ( something like say EMA Crossover happened ), I need to get all the stocks for which the strategy is fulfilled. For example: For EMA Crossover of (20,60). I need to know the stocks in NSE for which EMA crossover happened during live trading in 1-minute time frame. It would be great if my above requirement can be fulfilled with Pi. Please let me know the possible solution if any. I just want the pop-up message or alert with the stock name? Also I would like to know how reliable is it to use multiple scanners during live trading in PI? When I write the EMA Crossover logic in scanner, will it alert or pop-up message when the crossover happens during live trading? On Pi go to Alerts –> Scanner –>Click on New Scanner –> Give it a name –> Condition = LAST Select the periodicity, bar interval and days –> Click on Add Symbols to add the symbols on which you want to scan the given criteria. You can see the Added symbols in the ‘Added Symbols’ dropdown –> Click on Ok –> Click on Load. This will run the scanner and give you the list of scrips which meets your criteria. बॅक टेस्टिंग से आप यह पता लगा पाओगे यदि आपका ट्रेडिंग स्ट्रॅटजी कामयाब रहा है की नही. Looks like you are not enabled, can u send an email to [email protected] with your client ID. and sir ye scanner kya chij hai???? kya bracket order modify ho sakte hai? If i have 35 scrips in my watch list n if I have a strategy coded then is it possible that I get buy sell signal on all 35 scrips in real time n rather not just on a scrip whose chart is on my screen. There is an option called scanner on Pi. You can save your code on that, and keep scanning for signals. I have one query that suppose If I have enabled one strategy on pi as well as I am not in front of my laptop and laptop is shut down…..Can i get those alerts on my registered mobile number so once i get alert i could place orders through mobile app or through kite…. Currently not possible to run the strategy on cloud. But this is on our list of things to do. This is a great software. However, I can see that the trades are to be entered manually by clicking buttons. Is there any option for automatic buy and sell orders? SEBI has restricted complete automation on retail client terminals. I have to scan stocks that are crossing its “Previous Day High” . Previous provide code for the scanner. Why there is a difference in the back testing alerts and alerts generated at real time? I can see too many alerts getting generated at real time but in back testing there are very few. It probably has got to do with the code. Can you post the code u r backtesting. Please ignore the previous scripts that I posted. I had to post it multiple times as the entire script was not getting posted. If i have selected RSI or some other indicator in a cg=hart how do i remove the same from chart without closing it ? Select the study you have added and click on Delete button. This will remove the indicator. Possible to backtest multiple strategies at once? I mean combination of 2 or 3 strategies. I tried simply pasting two strategies one after one in buy and sell scripts sections of backtest. It was throwing some error. Is there any way to carry out that? For ex: I tried BB strategy and RSI, it was throwing error. Please find the print screen attached. SIR, backtest is a very good tool to use that can prevent getting huge lose.. thanks to you..
Can you please give me one code that can help me for better trade. i usually trade nifty future and options please give me code for this one. on 25 scrips or more in real time? n please make a video about scanner function for youtube. 1) audio notification that a buy or sell order is generated on the laptop. 2) message on my mobile incase I dont have access to the laptop. M getting error message : error in script, for scanner. But this same code runs smoothly in backtesting and EA. 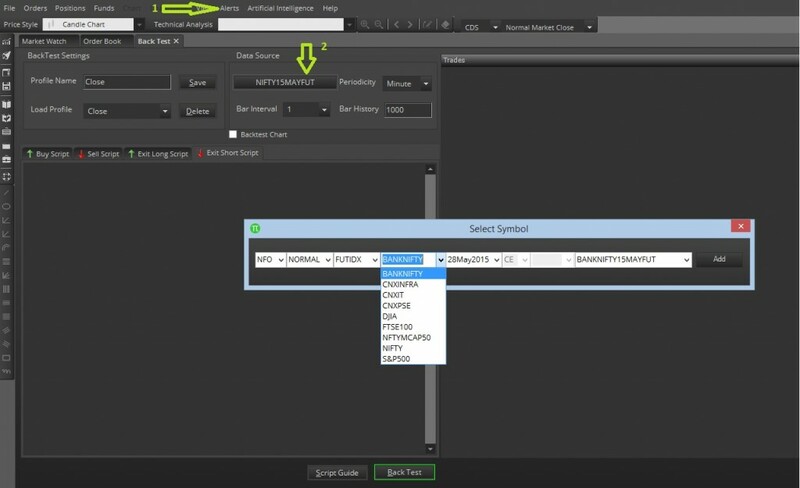 So how can I use this code in scanner – I want to scan a list of symbols for intraday. Firstly I should thank you for the well planned execution of your firm. I am very much happy about the PI EA, Keep up the good work. I know none of the strategy works in stock market if there is a surprise news like for example RATECUT…!!! I would be proud and happy If I do the same in KITE. Also I would like to thankyou for an idea about opentrade. Personally index derivatives is what I like. Can we do back testing in off market hours in Zerodha PI ( i mean after 3.30 PM). plz consider here i have 6 month data for backtesting. Yes you can backtest after market hours. Currently facing issues regarding Backtesting. Please tell me where i am doing wrong. Will get someone to call you back and help you with this. Nobody contacted me regarding this issue. Is it possible for EA alerts to directly open a BO dialogue box rather than the usual MIS/CO ? I want the EA to open orders at every bar open in the direction i specify in the EA. The number of orders also will be specified by me in the EA. But before the next order is opened at the next bar open, EA should secure the previous order with a stop loss at cost. Is this doable? Are there any 3rd party programmers who can programme this for me? Why don’t you post this on tradingqna.com, someone will most likely help you out. if yes ,then how to customise ?? hi nithin just check this modified heiken ashi daily candle with pi heiken ashi . last candle is of 2nd march 2016. 1st thing, I work only with “Cover Order” for better leverage. Can I create an EA in Pi with following situation? Can any one please tell me best automatic buy sell signal provider please? It is my request to you. from where we can get the manual / list of built-in functions of AFL ? We don’t have such a list for now. Does the backtesting a script not consider MIS? If i run through a script for more that 2 days, sometime it shows open position on 1st day and the closing it out another day. Yes, it won’t consider autosquare offs (so no MIS). Every time i use backtest there shows a alert “(‘Your script generated an error’) script generated no trades..make sure that atleast buy or sell script are typed in.”But i already copy and paste the script. when we backtest a script for certain historical data, the buy and sell signals generates only when the condition meet, so, if no pattern matches it will show error script generated no trades, try with high liquid stocks/futures like hdfcbank, nifty with more historical data and check if signals are generating. Can expert advisor code consider other scrips while generating the buy/sell ? Can we create custom EAs in other language (java,python) which have access to methods of TradeScript. This has 2 features, the value of "X" are not hardcoded and myJavaMethod can contain java code that can have custom made logic specific to my own trading strategies/methods. Hmm.. not really possible through EA. Btw, if you are a programmer, suggest you to look at : https://kite.trade/. Thanks for the prompt reply Nithin. I’ll check out that link and see what I can do. Many companies/brokers have started fully algotrading feature on VPS server. Are you planning to start like that. Peoples have strategies for fully algotrading. 1. While going through Tradescript strategies provided, I noticed that the candle stick pattern in Buy/Sell signal have been derived using the reference value of OHLC, which makes me wonder, does Pi’s expert advisors supports the candlestick pattern constant as given in Tradescript pdf for eg. can I use CP() = BULLISH_ENGULFING_LINE instead of those references in Pi’s EA? 2. Suppose my strategy requires the following condition : (Morningstar OR Dozi) AND MACD Up Trend. How can I go about it? 1. As of now one has to use what ever is referenced in EA . Predefined functions like BULLISH_ENGULFING_LINE wont be supported on tradescrip. Hi , Am i missing something?? I applied the EA and what i get is only alerts(under alerts–>generated alerts) , but dont get any buy/sell icon on the actual live chart ..
my requirment is very simple , i need my own customization indicator to be displayed in the chart . just like when i apply study , i can see that indicator on my chart . Ah, that is not really possible on Pi. You’d have to use amibroker etc for this. No, there’s no auto trading permitted on the retail trading platform. By clicking on Go live, alerts start getting generated. Means if you enter long or short by an alert you will have to exit manually , even if there is an exit alert that button will not work ! Is that really a technical error ? Or it’s only with me ? Can you suggest something from your expertise ? As I am missing so many trading opportunities ! It does work. I believe you’ve reported an issue, our team is looking into it. We’ll revert to you by Monday. I would like to know , are you using Pi EA and are those buy/sell working for you. I mean every generated alerts one by one working for you iwithout any trouble ? In your Pi software if I tick one EA from Artificial Intelligence drop down menu, what happens? Whenever the conditions match buy sell arrow erupts or sound alert comes? Or none? 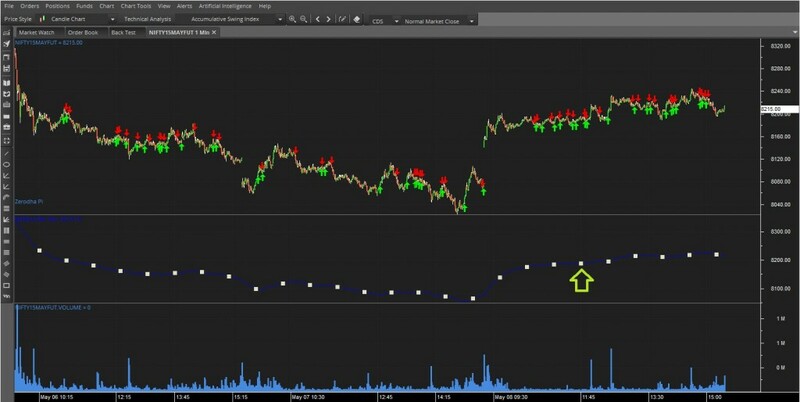 How to use your artificial intelligence on live chart for profitable trading please? Can I use EA for positional trades? or is it only for intraday trades. How do i check for a script which enters as soon as a price is broken on the up side ( down side for shorts ) . Currently all the scripts seem to work only on the candle close basis. In that case one has to define the price manually and set to get an alert on breaking it above. Do we have scanner for supertrend like it shud show scripts which are belw r abve supertrend at the eod or during the day. this is for scanner, how to choose 5 mtf and 15 mtf on scanner ? Is there an option to execute the Auto Buy/Sell signals generated, without user intervention? is this stand same till now ? cant we execute the buy or sell orders automatically ? is there any legal complication of the same in india ? Back test with 120 days is hardly useful. 120 days of back-testing for intraday data gives facility to back-test up-to 60,000 1 minute candles. One can do backtesting on daily candles for last 10 years. hi ! I am using supertrend for my trading . I am trying to use code for this indicator. Can you help me to code this & is it applicable on pi charts ? Also I want to know whether is it possible to code multiple indicators in different time frame ? What are the system requirements to automate the trade ? Also, is it required to be online or offline also we can automate? Automation requires exchange approvals and all. Suggest you to send an email to [email protected], he can explain. Hello sir any huge buying or selling is there ?? Is there any procedure to register my own technical indicator which offered automatic signal. Where shud I GO ? 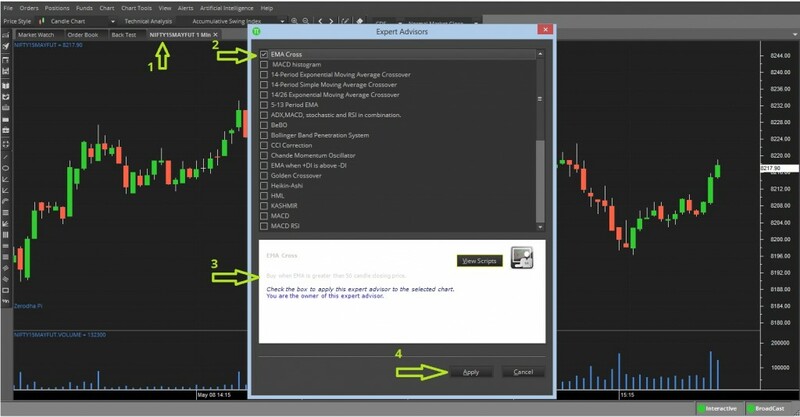 The above blogpost explains how to set expert advisor for generating automatic signals. sir will you introduce buying or selling on limit price in Bracket order. if we want to buy 3000 share in intraday in any script it buys on different prices which fails our strategy. When you place a limit order, there is no way to guarantee that full quantity will be executed in one trade. Go for Futures BO. This will ease up your pain a lot. If I open a 10 minute chart for a script at 915 am and apply a EA with EMA 50, will the EA wait for 50 10 minute candles to passby for the day before generating an alert or is the EA applied on running candles no matter the day? IOW, will my EA start generating alerts (if they are applicable) from the first candle of the day itself or will it wait for sometime for some kind of validation? A reply is greatly appreciated. It will depend on the chart you are looking at. It will be based on the data on the chart. If your chart has 50 10 min candles, it will start getting signals immediately, if not it will wait for the time period to complete. Thanks for your reply Mr.Kamath. PI doesn’t allow me to see more candles than that is generated during the market hours. IOW, I can see only the candles that are pertinent to the trading day in PI when I open a chart. How I fix it? I need my alerts / EAs to be effective with the running candles. I mean this during market hours. I can see previous day’s candles after market hours when I log out and log back in! Check this post. See the image “easy selection of periodicity/interval of charts”, shows while opening a chart you can select for how many days you want to open. By default it opens 1 day chart. i have applied it on one particular stock . but after close the chart by default Ea strategy also close for that stock. i have to create repeatedly if chart is close and open . Is there any solution whenever i open chart my created expert advise will be continue. And also i want apply my created strategy to all stocks without open each stock charts. You have to keep the chart open. You will have to individually apply expert advisors. is metastock language works on your software…? EA is within Pi. Meta Stock works with Pi Bridge. can we increase market watch from 5 to 8. 1) Give me the list of stocks from my watchlist who’s Weighted closing & Typical Price say 30 is about to cross over in say – 15 mins timeframe ? 2) Give me the list of shocks from my marketwatch whose CMP is breaking up or down the price defined by me. 1. You have to add stocks on the scanner, but yeah, u can. 2. Yep, again stocks have to be added on the scanner. It can’t pick up from marketwatch. I am great admirer of you. You folks did a great job which is commendable. I have downloaded MT5. Can I bridge NEST with it to trigger AUTO BUY/SELL orders. Also help me how can I open NSE futures/cash segment in MT5. The supertrend charts are really quick and human error is something that is losing the business. Please help me. You can’t really bridge NEST with MT5. Also this auto buy/sell requires some approvals and all. Hi my id is DO0042.Omprakash. Can you please tell the formula for how wti crude oil in dollar is converted to mcx crude oil. eg: Current price is $46.71 and how this price is calculated in mcx crude oil the formula. It is seen that when I put a Script/EA for the back test, it generated orders at the CLOSE price of the CANDLES instead of actual moment the script conditions are met. Whether the script generates alerts in same way when LIVE in Market? Kindly explain the logic of working of EA in LIVE market. It is because if the conditions are met same signal can be generated any number of times during the candle formation and it does not make any sense, also few times the conditions might get satisfied during the formation of candle but were not after the completion of the candle. The same in live markets. I’m just unable to “stop backtest” since it’s keep on opening new tab. can you please explain how to stop that? also each new tab unable to close since its giving me error message “The chart is currently in use”. please help on this issue. i have tried to uninstall and reinstall pi but still facing the same issue. How to program an EA for stochastic? Do anyone have the script? Back testing strategy doesn’t works with ICHIMOKU indicator, whenever I backtest on one stock so it keep on back testing the same stock, it doesn’t allow me to change the stock for another backtest. And whenever I press stop backtesting it opens another graph of same previous script, and this keeps on going till I logout and again log in to the Pi. Please look in to the issue. i need code for below startegy to apply as ALERT in PI for selectred scripts . a) 13 EMA crossover 34 EMA from below oving upwards..
b) Parabolic SAR is below candle . c) stochastic ( 10,3,3) is above 50 .
a) 13 EMA crossover 34 EMA from above moving below. b) Parabolic SAR is above candle . c) stochastic ( 10,3,3) is below 50 .
but there scope for improvement. Firstly, highly impressed with how far Zerodha has come and wish you luck for the future. I am unable to completely understand this data. 2. How is 96% profit calculated? 4. Does the algo consider squaring off at the EOD for respective trade? P.S. Are there any online resources to learn TradeScript? Can you write to [email protected] so that you will get a call to explain on this in detail. Goto help menu and select tradescript help to start to learn. Also can check http://tradingqna.com/ for more answers on tradescript. Hi my comment has been awaiting moderation since Aug 8. Could you please look into this? Can you please advise how I can write script to scan all scrips at end of day on daily chart to give me alerts ? How would I do it ? 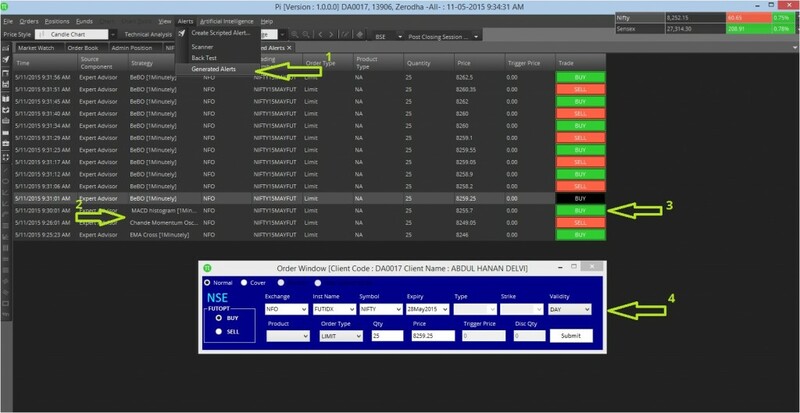 Create scripted alerts , scanners or Expert Advisors only works in live markets on intraday charts with live ticks based on last traded price, it will not give any alerts on after market hours, if you want to check the signals on daily basis with day candles you can use backtest and check with historical data. I want to know about the Expert advisor in live markets for the following strategy. It should scan the market watch or entire market alongwith Futures for OPEN = HIGH and OPEN = LOW condition. Is it possible. Please let me know. Being a beginner, it would be helpful if you could make some video clips of EAs’ & quant topic there is lot of things to remember and your presentation quite complicated, hope you will do the needful. Why cant zerodha add a windows to select the data from this date to this dat e.g 2/02/16 to 02/06/16.max. range of four month will not breach. software will work properly…….and backtesting can be done also on any range of date. It is on our list of things to do. Can you please provide details about the trend() function. I would like to know these details about this function: 1. How many previous candles does this function consider to decide about the trend? 2. Does it help in quickly getting the trend change? 3. Or is this useful only the determine the already prevailing trend? Choose the category as Algos, strategies and code. I need to know, is EA can be integrate with mobile version of kite. Not on the current version. You can right click on AFL chart and set your own parameters. please provide supertrend in expert advisor. Will pass on your feedback. 1) Can one EA be used on multiple charts during market hours ? 2) if yes then, can the settings be used next day , so that we don’t have to do them again ? 1. Yes. you have to open charts and run separately. 2. Ah.. you will have to open charts and run separately. Great….. Thanks for the prompt reply..
Every trader has his liking for one or more EA’s which is used by him on daily basis for trading. So it will be of great help if EA’s are included in chart template so that can be used very easily. Pl. Include this in future releases if possible. Just wanted to know how many days Intra day (ex. 5, 15,30,60 minutes) historic charts that we can view in your Pi software. Is it displaying intraday Charts for > 30 days ? We have intraday data for almost 2 years. For F&O, data available only from the start of the contract, we are working on giving continuous data on that as well. Very Interesting. I know tradescript doesn’t have supertrend function. So i think you are trying to create your own. I am working on the same problem. Will post when i find a solution. Sir, What’s the difference between creating scripted alerts and creating expert advisors? As I see, in creating scripted alerts there’s an extra option to write exit long and exit short strategy, but in creating EA, one can only write buy and Sell script. Does the scripted alerts generate buy, sell and exit trade(long/Short) signals? Yes, they are almost the same. Like you pointed, in scripted alerts, you get option to code two extra conditions. Sir, one last query. Does scripted alert generate exit trade signals, considering I have coded exit trade condition. sir, i am new to pi. while playing around software pi, i noticed that the results generated in back test (buy/sell signals) i.e., the green arrow and red arrow are not plotted on the graph. do i have to enable/disable any option so see the signals. please reply soon dear. Please make sure back-test chart is selected and if still facing any issue kindly write to [email protected]. Hi! I’m new to Zerodha “PI”. Does it possible to use PI “Scanner” (PI>Alerts>Scanner>New Scanner) to scan & short various Stocks based on their EOD Data (as EOD scanner)? Because, I’m getting only “Minute” & “Hour” options in “Periodicity” drop down menu! Is there any alternative option? If “Yes”, then requesting you to kindly let me know the procedure. If “No”, then requesting you to kindly incorporate the “EOD” scanning facility in to “PI”, which will be a great help to us & make the system near completed. Wish to have a prompt reply from your end as always. 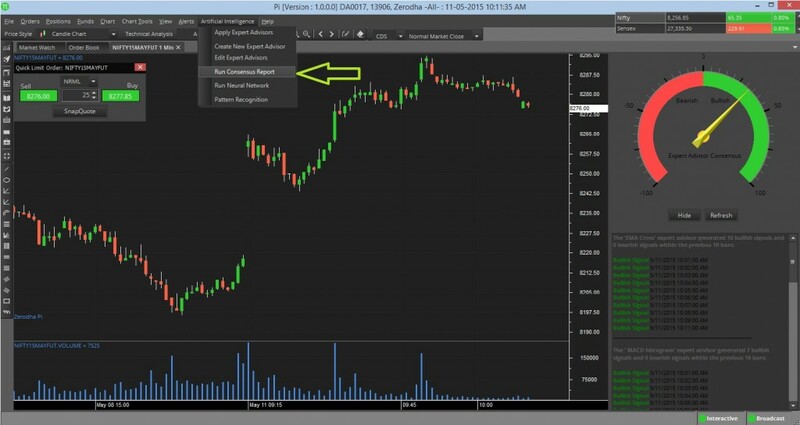 In Pi, the scanner feature works only in the live market hours as it scan or check based on last traded price of the given conditions to the list of stocks, currently in scanner there is only minute and hour time frame and no end of the day candle time frame as scanner will not work after market hours. We Will pass on your feedback. Trying backtesting and noticed on many results where it shows loss but percent profit is 0%. Is this an error or expected? Can post more examples if required. As per the above regarding profit / loss it is calculated with values given in the summary.Also,for last trade it is difference of the closing price of the chart data and last signal in summary section. you can check it in detail in back-testing summary section. back testing with my strategy showing buy sell signal properly and profitable trades but i applied the same strategy in scripted alert on live market it shows extra buy sell signals and trade end up in loss, why it happening how i can solve it. Create scripted alerts refers with current running candle, as repainting of candle happens you may get some more/false signals, repainting happens in every charting platform, to avoid this you can refer to previous candle or trade on only after close of the candle. Sir, i need Supertrend code for expert advisor. Please give. 2.) In Pi while testing out some strategies for backtesting , there are lots of stocks to select then how we can select multiple stocks in one run for a strategy . it’s very time consuming to select one by one and testing it out as we need to fine tune the strategy as well so it’ll take much more time !! 3.) For a single stock we backtest and change the parameters in strategy to get good result buy there are lots of factors in backtest result report that I know their meaning (Definition) but don’t know their affect on performance , so it would be good if your expert team can provide more detailed explanation with examples which strategy should be considered good or bad with risk,reward, sharpe ratio and so on. 4.) I feel for backtesting there should be more data as it would include all type of mkt data (uptrend, downtrend and sideways). Generally 4-5 months mkt would be in same trend then backtesting results are very favorable . Is it possible to backtest any strategy with Kite API with full historic data? 5.) Do you have any plan to share other strategy to traders same like OpenTrade ? 1. If a client is declaring that he is automating trades, he needs to become an AP on the exchange, get approvals for the strategy. Either Kite connect API’s or Pi bridge will work. If strategy involves BSE, then yeah that as well. 2. If you are trying to do this for automation, suggest you try backtesting on Amibroker. Pi is just a good starting point. 3. All the details of this is available on google. Lots of information on these ratios. 4. Yes, you can use Kite API to backtest. 5. Hmm.. no plans as such. Sir, please add Supertrend code for expert advisor. so that it can be available for trading. How to scan multiple stocks for supertrend crossovers and correspondingly generate alert on the pi screen? Supertrend indicator is available under study in Pi. You can’t use Super trend in the scanner for now. hello sir, while creating tradescipt EA for backtesting what function to use for supertrend? I used ST,STR,SUPERTREND, but it was showing undefined function. TREND(SUPERTREND(15, 5), 5) = DOWN. while trying backtesting in zerodha pi, i applied buy and sell code of EMA that shown above in the article and start backtest. Everything goes fine but the chart doesn’t show any buy and sell arrow. i tried backing on nifty dec future on one minute periodicity with 1 bar interval for 30 days. Please help me out on this as I’m eager to study backtesting. how we use multi time-frames for same (one) script. There’s no option to use multi time frames on a single chart. Also EA or tradescript works with OHLC values and timeframe cannot be set through code, one will have to change/set chart time frame manually. How to plot backtest chart? I can see one green and red arrow on the corner but nothing other than that. NO help document as well. My trade script generated at least 20 trades but i couldn’t see any single arrow out there. Is there are strategy available for Renkos using EAs ? Renkos with PSAR or EMS crossover etc ? No, you can’t use Renkos using EA. I have a query, consider I have also coded the Exit Long and Exit Short script with the buy and sell script, will pi generate the exit trade button(signal) in the generated alert window? Or will it only generate buy and sell signal? It’ll only generate buy and sell signals. Suppose, an EA gave my buy signal and I placed the trade according to it. After some time the same EA gave me sell signal on the same instrument and I placed the sell order, at this time will the long trade be automatically closed by pi/EA or do I have to manually close it (after entering sell order). No, positions will not be squared of automatically. You’ll have to manually close them. Started trading recently with Zerodha and satisfied with the platform and services. I am trying to backtest intraday MIS strategy with Pi but getting some weird results. The buy and sell occurs only when conditions are fulfilled but I want to exit on day end or some exit conditions (even exit long and exit short conditions seems to be fishy) . Can someone please help me with this.It would be great if some example with buy & sell script is provided. Can I run multiple EA on multiple instruments at a single time, without opening their chart. No, you can’t. You’ll have to have the chart open. This is the 3rd time I’m asking this ques. please rply..
Dipesh, can you send an email to [email protected], someone will call back and check. Ideally it should work. I have a query, the EA i wrote keeps giving me buy/sell signal again and again whenever a new candle forms and the condition is true, “even when I am already in trade and had placed an order”. How to stop this? Is it possible to generate automatic trades using moving averages on Pi or other zerodha software. No I dont understand programming, is there any other way to generate trades based on tradescript signals? or anybody can help with this? Really need your help in writing an automated script for me. When I try to execute it on PI it throws an error. My code should have all the following conditions. Can you post this on tradingqna.com, algogeek will answer. Backtesting has to be done individually. You can use scanner to to give you alerts where signals are generated on a bunch of stocks. Hi can I use Pi on Mac OS?? 2.For selling – 3EMA crosses 15 & 51 on downside. Please help me with the code of this strategy so that I can backtest it. Dear Sir, Please let me know how to configure voice alert for buying signal and sell signal. Currently we don’t have, but in future we will. While trying backtesting in Pi, I noticed there is no option to enter ‘weekly’ in the “periodicity” field. It allows us to enter only minutes or EOD prices. I can not test any strategy with weekly closing prices. Can you configure this option as well. Thank you for the scripts and the scripting feature. The user has to add each script to each stock one by one. If he has two or three computer systems, does he have to repeat the process manually on all the systems? Perhaps, copying a configuration file in Pi installation folder in my desktop and pasting it into Pi installation folder in my laptop must bring up my setup in desktop to laptop. Does the feature already exist? if the answer is no, would it be possible to add it in future? Thank you. Currently doesn’t exist, but definitely in the future. Will ea be created to buy sell on supertrend on renko chart??? Or it is too complicated??? how to install nest platform.i tried multiple time i cant do it.please explain correct way. If i added and loaded a new scanner coding with number of stocks, does it give me the signal as soon as the crossover happens or do i need to load the scanner again after particular time. Yes, you just have to load it once and run. Make sure in backtest window under the data source panel Back-test chart is selected,only then signals will be plotted on chart, for more help on this you can write to [email protected]. we will reach you on this. It is not possible using scanner on Pi. I have a strategy where I use multiple indicators for a chart. Can I use multiple expert advisors to give me an alert after considering in all the factors which I have put for each an every expert advisor. Yes, you can combine multiple EA in one with And/Or/Not etc. Can you please suggest any basic Expert advisor codes where I can learn them from scratch. I have read your algo-z blog where you had given the codes for the strategies where users had asked you, however I didnot find any over here. Could you please help me out on this front. Check this list https://zerodha.com/expert-advisors/, good starting point. I am newly registered on Zerodha, I am dumb at coding, I am doubtful whether I will be comfortable trading at Zerodha. Sanjay, less than 1% of our clients actually code. Check this video playlist on Kite, probably the most popular web platform in the country currently. SIR PLEASE ADD KAUFFMAN MOVING AVERAGE ON KITE …. I dont find many examples of coding for Back testing. More importantly there is not a single example related to Exit coding. I have written a code related to RSI trades but the back testing is showing absurd results. Please add Percentage Profit & Loss in the Equity holding section in PI. How to use 2 different indicators in the same script? You can add the indicators separately. If you wish to overlay, ou can drag and drop using the cursor. I want to apply an EA on a 30 min chart. So, I open the chart, set it to 30 mins and then apply the EA. But the EA always seems to be running on the 1 min chart, generating alerts “-[1Minutely]”. Anything else I need to do in order to get this to work on 30 min interval? Another question related to the above. I keep getting ‘Your script generated an error’ on the scanner screen for my script and the same script runs absolutely fine on the Backtesting and EA screens. Is there any formatting required? I’m assuming you’re copy pasting the code from the Backtesting screen to the scanner screen. Have observed that by copy pasting, it loses the formatting. This may be the reason you’re getting the error. Can you send your code to [email protected] so that we could review and give you feedback? Thanks for the prompt reply, Venu. I have sent the code to [email protected]. I noticed that the scanner clears all the new line characters of the code. So, I gave a space between each line, but that did not work either. Also, what about the 30 min chart for EA? Why does Pi only consider 1 min chart when I run EA on a 30 min chart? The concerned will reply to your ticket giving clarifications. why to use pi if thr kite?? can any1 explain. m new here.is thr is free exprt advise in pi?? Aman, Pi is a desktop platform, some people find it more comfortable. Kite has everything you need. mt4 ka indicators kaise add hoga pi mai. Hi, For now, it is not possible. MT4 is designed in such a way that it is very tough to send signals. ek he indicators bahuat sare terminal mai kaise aa jata hai .exm— sharekhan indiainfoline aur aapka pi bhi samil hai .hum convert kyu nahi kar sakte hai. Is there a way to load pre-market F&O limit orders into Pi using tradescript? 2. The recent update of 52 weeks high and low and open, low and high filter is very good. but why F&O stocks filter is not able. Can I do back testing with the formula of average true range ? Can I have formula for Average true range in PI?. if you can get me formula for Volspread also will be great. Buy the nearest ATM Straddle (Call and Put) for nifty in the morning. You can only code technical analysis strategies. I have zerodha account. Query so simple but still not answered by any trading house, why there is no alert sounds or popups for Supertrend indicator. If there is alert facility, then there may be high percentage of winning trades. Please make some options for alert sound or pops for selected scrips. I m in search that more than one order can execute on time set by user. but it needs just one ……. just one thing …………. scanner alerts should be shown in generated alerts window. Can the algorithm be set to trade in options? If yes then can it select the option strike based on a logic and implement the trade at a specified time? Can the square off be automated based on MTM of two trades rather then stop loss of single option? Can you please provide functions to get current position price. if I bought share for say 100 with autobuy and if price goes to 104 they it should sell and if it goes 98 it should exit position ie… maintaining 1:2 RR ration. It would be helpful if there is user manual containing all function to refer. the complete reference of tradescript documentation is available under help menu -> tradescript help. I had a doubt for the scanner ! how much scripts can be added to a scanner ? and cant we create our own list for the scanner? as in i want to scan all the fno scripts how can i do that ? No limit as such,one can create their own list and yes can add all fno stocks but one has to add each scrip individually. For further queries on this you can write to [email protected]. Adding indiviaully would be a very hectic task ! would request you to make one predefined space for the same ! even once we create the list we cant save the same right ? Hello Sir, Is there a release of Pi that can be used on a Mac? Is there a way to code in EA such that there are no short sells. A sell should only happen if there is a buy before. Yeah, do check out all the sample codes. the link given in the post above. I am sending u these strategies. can these be coded by ur team. 1. When scrip breaks previous day high. 3. When scrip is -.50% or+ .50% with price and increase in volume. Can you post this on tradingqna.com under algos section. Is there a fully automated trading possibility by adding Take profit, Trailing stop, stop loss and lot multiplier features?? Fully automated trading will require you to clear certifications, obtain approvals etc. You can write to [email protected] for more. Can we have commands to identify the MAX value during a particular time period, say 11 AM to 11.55 AM? can you please share your opinion on the below quires? 1. Can i able to place the automatic buy or sell order once EA gives me the buy or sell signal with quantity? 2. Can i read the order or traded values in the EA? The code given is (SMA(High,9)+SMA(Low,9))/2. Why do we need to take SMA of high of 9 periods? I Need coding for the following techniques. I am new in trading. BUY : If next day by 10:30 am current price is above pivot and total volume from opening to 10:30 am greater than previous days total volume. 1. STOCHASTIC(5,3,3) above 75 peak breakout. 3. MFI(14)above 60 peak breakout. BUY : EMA(14)> EMA(28)> EMA(56) and RSI(14) also also closes above all. 1. Today’s close must be 1% above previous days close. 2.RSI(14) must cross 68 mark. 3.MFI(14) must cross 68 mark. 5. WMA 3 crosses the WMA 5. Can you post these on tradingqna in algos section. 1) Can I backtest the Chart with 3-4 indcators at the same time? 2) How can the code of each indicator with will be combined in a single backtest? 3) I am applying for Finance intern from last 2 year but didnt get the chance. My MBA Finance is going to complete and I really want to start my career with Zerodha. I am regurlarly sending my CVs also but haven’t get any response.Hope to hear good from your side. 3. We don’t have internship opportunities Pratik. I have a strategy but i do now know how do i code it. Would you please suggest a way through which this strategy can be coded and backtested. Do go through all the sample code and the video link given above. I was trying the Backtest in Zerodha Pi. 2. My Sell Script with Exit Short Script. The first one gives result. While the second one gives error. It seems like I have to enter both Buy and Sell Script. Why sir? Why can’t I backtest only the Sell Script. Can you post all coding related queries on tradingqna under algos section. Hello sir . i am earning good profit from zerodha expert advisor. But sir is there anyway the alerts genrated by Ea can be put automatically in exchange? No jay. Exchanges won’t allow. 1. We get a buy/sell signal in the Pi Scanner. 2. Pi gets disconnected from the internet. Can we open Pi and Kite on the same system using same user id at the same time? Jai, no you cannot. You can be logged into only one platform at a time. HI Nithin is there a limit to number of scrips that I could apply expert advisor. Example say my market watch has 50 scrips can I apply expert advisor to all these 50 stocks. Help me to find my exit strategy in Zerodha Pi. For buy entry, Exit Order shall be triggered when price falls below the previous two candle’s low. And for sell entry stop loss shall be triggered when price cross above previous two candle’s high. Shardul, can you post this query here. Pi Alert to my Mobile – as an SMS. We don’t have an SMS alert feature as of now for Pi. This is something we’d prefer to avoid as SMS delivery times are never reliable and real-time trade alerts via SMS may just lead to poor user experience. can i apply exprt advisory for multiple stocks?I want to apply the same advisor for multple stocks at once . Hey Lingraj, EZ can only be applied to a single stock at a time right now. You’ll have to run the script separately for each symbol. I did not find Online Opening trading account with Zerodha a best way, I should have opted for Offline process As this way all paperwork would have completed at the same. Your customer care team is not on the same page, if I ask a single query to 3 people, I will get 3 different answers. I am new to Zerodha dashboard so I had queries (I know there is a video tutorial available there). Ashish, all you need to know about Kite is explained in the user manual, videos and on Tradingqna. 1) Is there any code for Super trend in EA ? 2) How to apply it for multiple stock future in Nifty Midcap 50 ? Is there anyway the alerts generated by EA can be put automatically in exchange? Or can I get sample TradeScript to automatically place Orders. I am sivakumar, I am a b.com graduate and I would like to do a automatic trade in zerodha pi but since no one is helping me out. they re asking for coding for my strategy but I don’t know to create coding and zerodha support team ask me to go for tradingtna but I didn’t get a possible response so let me know how to proceed further and please tell how to get codings for my strategy and who will help me this scenario. Shivakumar, I’m afraid you’ll first have to learn how to code your strategies before you start with this. There’s just no way around it. hello sir, i am trading in 20 stocks suppose, can i apply expert advisors in all of them with one click and see generated alerts ? or i have to open each chart, apply EA and then view generated alerts? 1.Once market opens by 9:15, after 5 min a candle is complete for a 5 min tf. 3.After that for previous days find out all candles with same height of above and list it with their date & time or highlight them on the pi chart. How to code this and where I need to run this script is it Scanner or New Scripted Alert? Hey Nikhil, best post your query here. sir when I open zerodha kite in web page, it occur blank. In my laptop web zerodha kite platform is not opened. what is the possible fault can be, and how it can resolve. I have already write is problem to your team but result is zero. I have a question. How to generate buy and sell signal using expert adviser for all the NSE listed stocks, without opening the respective charts and generating advise. My intention is, when I click a generate expert adviser button, It should advise me to buy or sell any stock listed in NSE or BSE stocks without opening the chart. Whereas Zerodha has the pi scanner (executes only for only one condition) which generates only “buy or sell” type of signal. I need to Buy and sell signal in the same sort of a system. 1. Brokerage charges are higher in pi compare to kite? 2. If I use algo in pi , there is any extra charges would be paid by trader? The brokerage is same for Pi and Kite Ram. No difference. No extra charges for using expert advisors or scripted alerts on Pi. Is any option to view to volume gainer stocks in kite? 1. these APIs are available with kite or third party software? 2. any fee is required for that software? 3. these APIs will work with PI algo generated alerts? Hey Ram. Exchanges don’t allow automation for retail traders. The Kite Connect APIs allow you to create a trading experience for yourself that we may not be able to provide. Best write to talk[at]rainmatter.com with queries pertaining to the APIs. Is it possible to write script in PI to scan all scrips – EA at end of day on daily / intraday to give me alerts with single click? I want to set a variable in the Buy Script and check that variable in the sell script to determine selling price. I tried going through the TRADESCRIPT documentation on Zerodha Pi, but couldn’t find anything useful. Built-in function LLV do not work properly. In place of giving lowest low it is giving lowest high. Can your team please rectify this issue. I want to buy/sell a script based on a trigger in a different script. For example, I might buy a bank stock after a bullish crossover in bank nifty? Can someone please let me know whether this is possible in PI or Kite? If yes, will learning the coding language that can be downloaded from PI would be suffice? Would be great if someone could help me regarding this!! Always seen PI is not working correctly. always gone to “not responding” plz do something on it. its not only my issue, it happened with my lot of friends. do something. Yes happens all the time.. Backtesting worked but I haven’t been able to run my scripts ever in live market.. It always(3 out of 3) have crashed. 1) Using EA, which signal will be produced first, a buy or a sell ? 2) Assuming the first signal is buy & I executed the order, what will be the the next signal, will it be sell ? or it can be any ? 3) If answer is any then what is the maximum limit to produce back to back buy signals provided that all the signals are being executed, apart from the margins required. How the exit strategy can be automated in this case. Writing an EA for buy & its exit condition AND a separate EA for sell & its exit condition, can there be a case where first signal is generated based upon the exit condition without having the actual trade in place. How that can be handled, do I have access to the last trade/order executed using the EA ? Hi Nitin, I was trying my hand on the Back Test and found that the result changes depending on whether I click the back test chart or not. For instance, when I run the without the chart, it shows 8 profitable trades but when I click on the chart, it shows only 1 profitable trade. Can you please let me know the issue? Ideally It Happens When The Timeframe Used On Backtest And Chart Differs. Is it Possible To Automate Order Placement Instead Placing It Manually From Alerts ? Hey Debolina, automated trading isn’t allowed for retail traders in India. Your expert advisor is very good, I tried this logic its very profitable on some scripts, but I can’t make this to code, below is the buy and sell script logic please make it in code. Here is the Buy script condition, please follow this, i don’t know why some symbols are not visible main comment. I want to backtest on some script HL break on a pertuculer candle for the day. How can I apply the strategy.? Is there any document or something which gives me an idea with an example. I am new to Pi? How can I get zerodha pi software? You can download it here, Asish. Can we create and backtest strategies for range charts in Pi ? I personally prefer range charts over normal candlesticks charts, so just wanted to know that. Sir, Can you please provide me a scanner code such that it alerts me when a stock has reached at a certain pivot point like R2 or S2. Hey Akanksha, have you checked out Streak. Quite easy to do this and much more with Streak. I am getting 2 issues after creation of EA’s. 1. Is there any way to apply EA’s to all chars of my current Market watch. Currently, i have to apply it by opening one one chart. and then have to apply EA. Also in that , I am getting message as ‘I am exceeded the limit to open charts ‘. and i can not close it. 2. If i close the chart, my applied EA is gone and i need to do the same work again by opening chart and need to apply EA again. any way to solve both issue will be helpful. Can you share Elliott wave scanner code for intraday in zerodha pi ? is there any expert advisors available for Elliott wave concept in zerodha pi ? Unfortunately, there are no expert advisors available for Elliot wave theory. can create a bracket order EA for stocks, options and index ? This is regarding Our Pi software. In back testing we have to select 1 by 1 stock, instead of that can we include the whole stock list as it is included while creating new scanner with three options as, add symbols, add MW symbols & add default symbols. and the results to be showed in horizontal manner for all the stocks added. or some alert popup with sound when alert generated in scanner, as, if we are working in some other window we cannot know the generated alerts in scanner until we again open the scanner window. This will be very useful and time saving for us. Plz revert if my suggestion is worth. Hope for your kind support. Actually what i need is it possible to create Bracket order Expert advisor for stock in Pi ? This feature isn’t available on Pi. Just want to confirm with you that you don’t have Ichimoku Cloud in Zerodha Pi or is it that I don’t see the Ichimoku indicator in my application. Wondering how can I use the Expert Advisor for Ichimoku ( which is available on your site ) if I don’t see the indicator in the Pi software. I’ll really appreciate if you can add ichimoku indicator in Pi because all my trading decisions are based on Ichimoku. Ichimoku isn’t available on Pi, I’m afraid. You’ll have to use Kite for this indicator. PI is having a Buy and Sell scripting option in single window, so for eg. if my buy and sell signal is based on the crossover, assuming first crossover signal is for buy, than the another crossover happens and the Sell signal will trigger, after the Sell Crossover, will it wait for a new buy signal or it will Short at the same point. Simplifying my query with below given steps. Please help to understand this scenario. Additionally is there any other way to trigger Short trade. & Sell when stock if 1% lower than the opening range low.